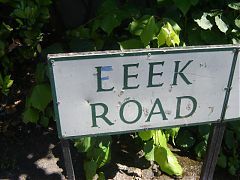 Leek Road – a green-on-white free-standing sign with possibly my favourite ever piece of graffiti: the L modified to an E, to read “Eeek Road”. I do feel it should have an exclamation mark, though. This sign is a double sign with City Road on the other half (not pictured).